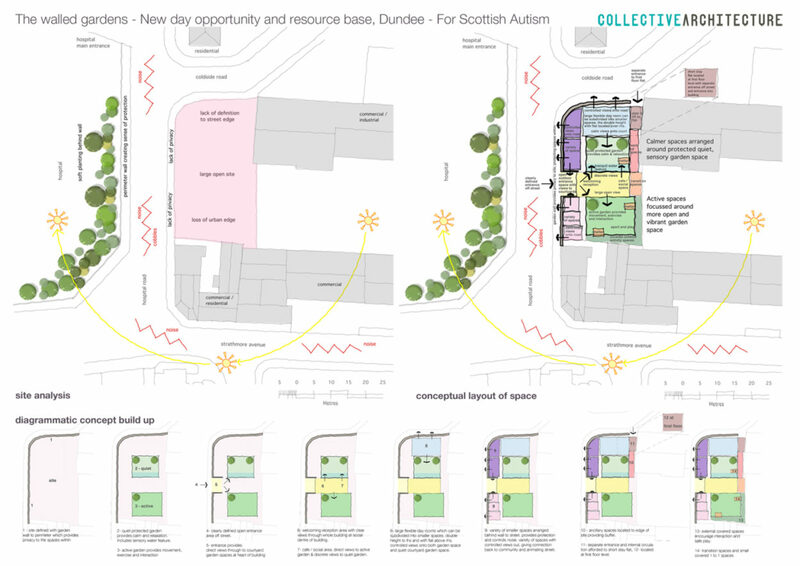 Collective Architecture entered an open competition for a new building for Scottish Autism in Dundee, and were shortlisted as one of the finalists. Our sketch design, 'The walled gardens', proposed the introduction of a strong wall onto the road outside, which provided protection, privacy and security to a series of bespoke spaces, all of which are arranged around two courtyard gardens. The wall is a response to the strong protective edge which is provided to the hospital to the other side of the road, but differs by offering up a number of controlled and carefully placed apertures and openings which animate the street frontage. The gardens behind the wall form the heart of the building. Each garden has its own character, one is a tranquil and secluded space offering respite and calm from the world outside. The second garden is a more active and engaged space, which promotes larger interactions, exercise and group involvement. Other spaces within the building are arranged around these gardens according to the nature of the activities that they provide for. A large welcoming clearly defined entrance porch is cut into the wall at the centre of wall. On entering the building both the garden courtyards are revealed, to either side of the reception area and social spaces which are arranged at the centre of the building. The calm spaces arranged around the quiet garden courtyard include a number of flexible day room spaces, which are afforded a variety of room sizes and ceiling heights. 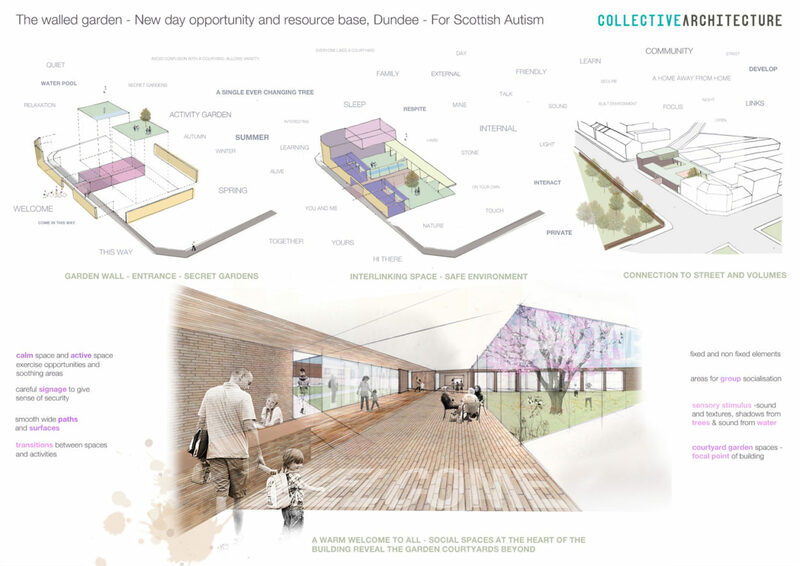 The active garden is envisaged as a space for group activities and exercise, as well as small scale gardening tasks. A number of transition spaces, which provide small intimate shelters within the gardens, are located to the edges of the site. These provide residents with opportunities for one to one interaction, and allow them to engage with the activities in the gardens from afar. The quiet garden to north is a more tranquil and peaceful space, with shelter under trees and a pool with running water to provide soothing sounds and calm movement.